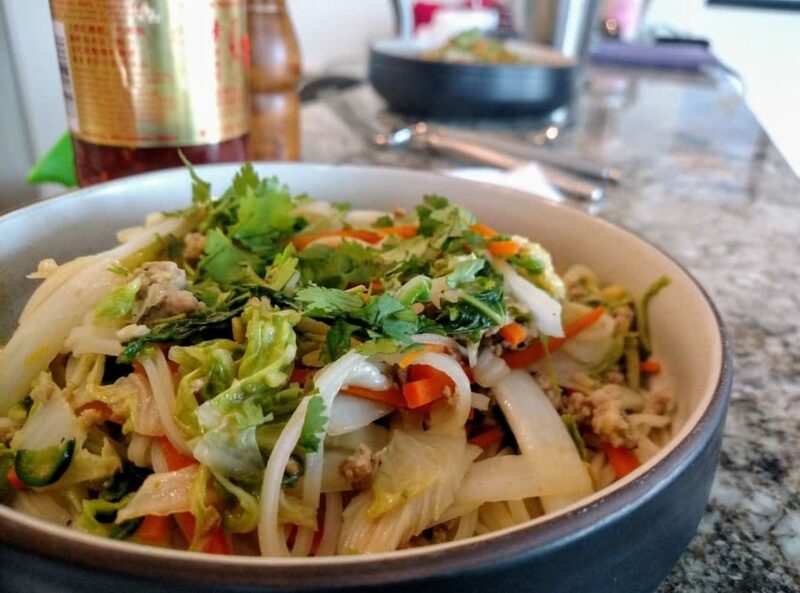 This cabbage stir-fry is a great mid-week recipes to have in your toolbox. Incredibly quick to prepare yet packs a great flavor punch with a strong crunch. Make sure to cook your base rice or noodles when you begin chopping as this recipe goes very fast. Added 110g (1/4 pound) of pork cooked in peanut oil with salt and pepper at the end. We kept our cabbage a bit thicker to provide more of a crunch which we preferred. Resting the dish for about 5 minutes before the final heating added a bit more flavor but could be skipped if you are short on time. This dish has been great with jasmine rice (1/4 cup dried per person), soba noodles (2 ounces per person) and thin rice noodles (2 ounces per person). The recipe as written serves two for a hearty main dish with no sides.